Size: 16 3/8" x 74"
This table runner was a late wedding present for my niece and her husband (they had two babies before I got around to making this). I just delivered it to them today. The batik fabrics are from The Stitchin' Post (Sisters, OR) and Fabric Depot (Portland). The gold border is from Tea Time Calicos (Beaverton, OR). I quilted a floral pattern to reflect the pattern in their Lenox china "Floral Fusion"
...and it's reversible. The colors on the front match their dining room and their "fancy" china but I felt the colors and pattern were a bit too much for the Lenox dishes. 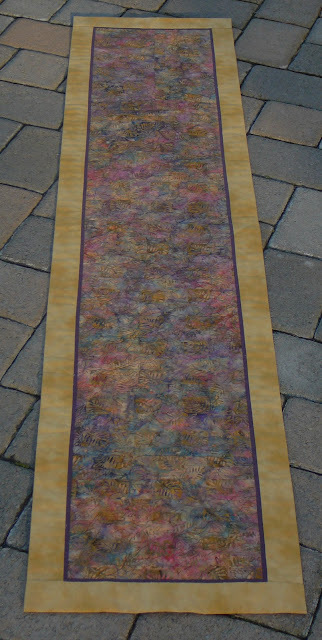 I had some batik fabric on hand that was a good match so I pieced that together for the back and added a narrow inner border of purple. So what now? I have a few projects yet to be finished, and no known babies or marriages on the horizon, so perhaps I will tackle those next. Magnificent! How long is this runner? Thanks. I have the dimensions listed at the top of the post. That is a beauty, Susan! Thanks for showing it. Glad you like it. Maybe you need one too?